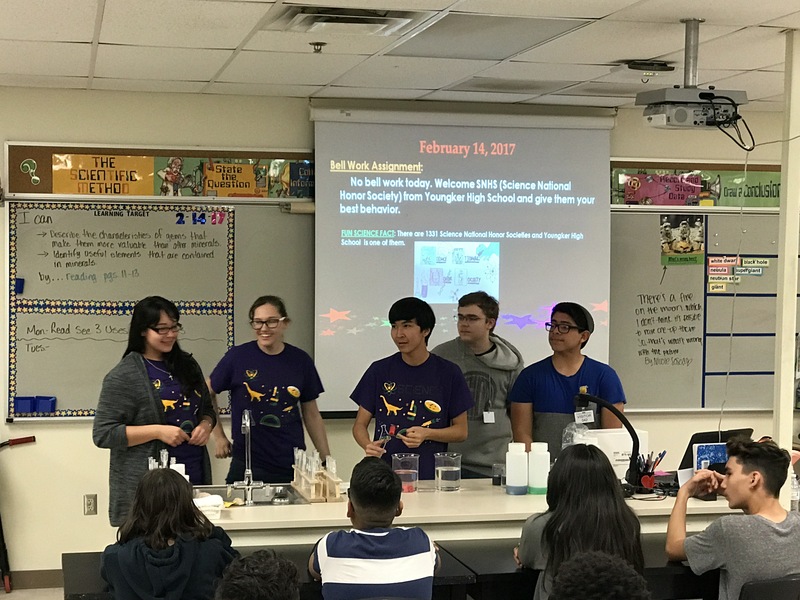 Westpark elementary school hosted curriculum night on November 2nd and invited the YHS chapter of Science NHS to attend. Several students traveled to the elementary school to demonstrate fun science! Science NHS had two stations that students and their families could visit. The demonstrated how different elements burn different colors in a flame test. Arianna and Levi burned copper ions, strontium ions, and barium ions to produce flames of green, bright red, and yellow. They explained how the different colors let scientists identify elements and make fireworks! The second station allowed students to be more hands-on. Maddie, Tamira, David, Kiara, and Jessica allow set up shaving cream with small drops of food coloring in it. Because shaving cream and food coloring don’t mix well, you can create some fun looking patterns. Paper and food coloring mix really well, so those fun tie-dyed colors make some very cool looking cards! The Science NHS members could explain that shaving cream has lots of nonpolar parts while food color and paper have more polar parts. Since food coloring and paper are more similar, they mix better. This fun bit of science makes for some super colorful creations! Thanks to Westpark Elementary school for letting us share our love of science. Every fall, the Rio Salado Audubon Center has Saturday conservation work days. These work days range from making owl habitats to cleaning up trash in the Rio Salado waterways. On October 21st, nine of the YHS Science NHS members participated in a work day to help make better habitat for monarch butterflies. Monarch butterflies are a species of butterfly that live and migrate through Arizona. They feed on nectar and lay their eggs on desert milkweed. Desert milkweed is the only plant the caterpillars will feed on, so it is an important plant for monarchs in the Sonoran desert. The Arizona Audubon Society wants to help monarchs in Arizona by planting more of the milkweed as well as other nectaring plants that the adult monarch butterflies can feed on. To achieve their goals, they asked volunteers to work in their butterfly garden planting desert milkweed, fairy duster, and other plants that will help butterflies. Armed with shovels, picks, and plants, we joined other volunteers in digging holes, pulling out rocks, and planting plants to help attracted butterflies to the area. While the work was difficult, it was ultimately rewarding when one of the center employees pointed out a monarch butterfly at one of the newly planted plants. Once we finished with the butterfly garden, we also helped in pulling out invasive buffelgrass from the Rio Salado river area. Buffelgrass is native to Africa and was brought to the Americans as food for livestock. The problem with buffelgrass is that it out competes our native desert plants and is taking over many parts of the Sonoran Desert. To help get rid of this pest plant, we took out shovels and picks and pulled them out by the roots. We had a fun time at the Arizona Audubon Center helping native desert wildlife and their habitat. Thanks to the students who attended and who worked so hard to conserve Arizona wildlife! 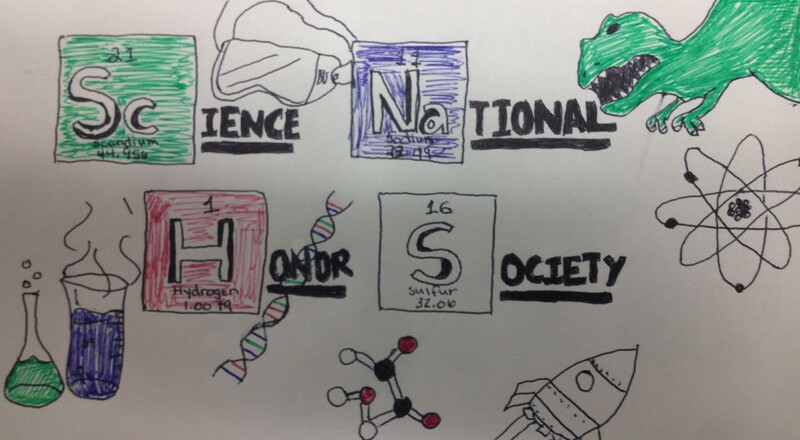 This year is looking to be another great year for Science NHS at Youngker High School. I’m excited to see old members returning and excited to meet new members. This year we will continue posting students’ summaries of their citizen science projects and their community outreach projects. Students will also write a short summary of a scientific paper that we read as a group, so look out of those posts. On Valentine’s Day, 5 members of YHS SNHS visited Freedom Elementary School to spread some science love. Jacob, Eric, Ana, Mackenzie and Erick shared their knowledge about density with Mrs. Roland’s 7th grade science classes. 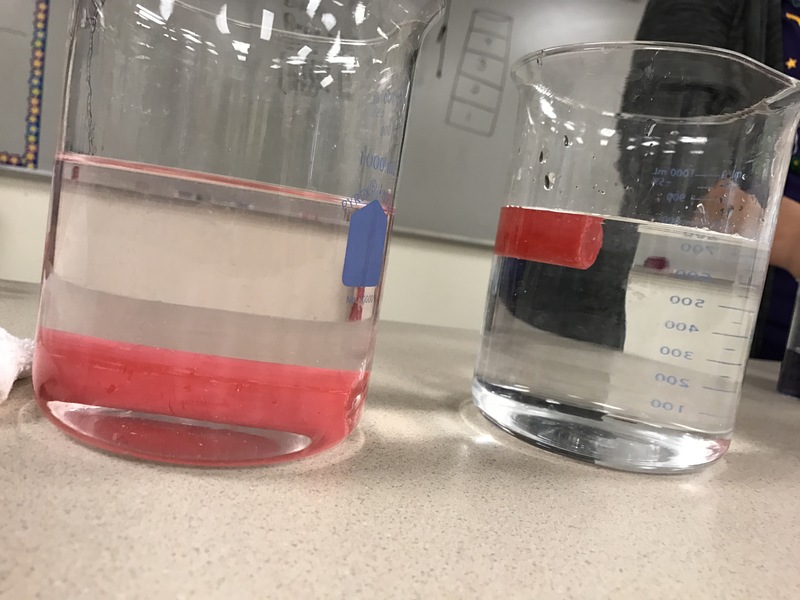 The SNHS students demonstrated density by having the 7th grade students make observations about a small candle in water and a large candle in ethanol. The density of the candle compared to the ethanol makes the candle sink. However, the same candle floats when placed in water. The 7th grade students where then tasked with creating a density column using their new knowledge of density. 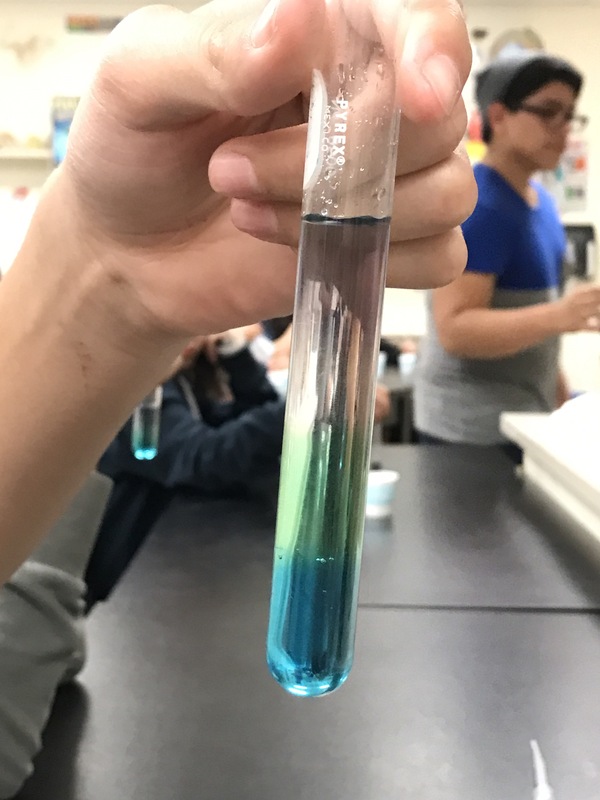 The 7th grade students where given different colored liquids of different densities. They could then add them to a test tube in order of highest density to lowest density to create a colorful column. These columns are possible because a water solution with more sugar is more dense, causing the different layers to not mix! We are back in full swing here at YHS. The YHS chapter of the Science NHS has started up again for our 3rd year of being science enthusiasts. This year we are looking to continue our work with science outreach in our community by assisting at elementary schools as well as communicating with local scientists. Students are also participating in their own science by doing citizen science projects. Posts for these will start back up soon. Already this year we have worked with community partners. On September 17th, members of the YHS chapter of Science NHS traveled down to the Rio Salado Audubon Center in central Phoenix to pick up trash. The Rio Salado is a conservation center in the heart of the city that services as both nature trails and a riparian habitat for many species, including monarch butterflies. This area also has a large seasonal river, where trash often accumulates after the monsoon rains. Every third Saturday, Arizona Audubon hosts a conservation day at the Rio Salado site. The September conservation day was to walk along the now dry river bed and pick up trash. Students from YHS walked along the dried river bed to pick up plastic bottles, Styrofoam cups, and aluminum cans, among other things, in order to protect that fragile riparian habitat for wildlife and people to enjoy. While difficult work, the students enjoyed the fact that they were helping out our local ecosystems. Today I took 8 students to the ISEF held at the Phoenix convention center. The fair showcases students from around the world who have competed in local, regional, and state science fairs and have won in their category. They now are competing for chances to win a total of $4 million in scholarships and prizes. Some of the projects are truly amazing. Students are using research techniques to solve problems such as dust allergies, milk allergies, and identifying breast cancer at earlier stages. It’s inspiring. My students are here to observe, ask questions, and be inspired. They have part updated in some hands-on labs where they had to think about problems in a different way. The invasive species lab was partially good because it dealt with some local and global problems. Students looked at how zebra and quagga mussels effect local ecosystems and have a global impact on both other species and human endeavors. The ISEF is a great place to see how one person or a group of people can change the world by looking for solutions to problems they encounter. Hopefully some of that inspiration with transfer to my students and they will look at the problems facing the world in a different way.